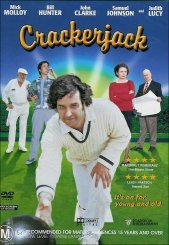 Mick Molloy stars in this beaut Aussie movie involving lawn bowls, parking and mateship. Best defined as a feel good movie, Crackerjack had me laughing from start to finish and is one of the most enjoyable movies that I have seen in some time. Cityside Bowling Club is your old fashioned bowling club with traditional values and the time old tradition of being a club for members run by the members. As time is passing however, members are dying off and the little club is being pressured to make extra revenue by adding poker machines to their club to get punters in. All is looking bleak, especially when they cannot field a team, which will spell the death of the club. A panicked search for playing members ensues and that's where we find Jack Simpson. Simpson (Molloy) is a call centre worker who has been a member of the club for a number of years in order to take advantage of parking spaces. Leasing the spaces to his workmates has brought in a tidy sum of money and all is good for Jack until the day the club locates it's mystery member and enlist him to play for the club or forfeit his beloved parking space. What follows is a spree of mirth as the younger generation meets the older one in a hilarious tale as the fight to sustain the club is undertaken. There are a few sad moments, however for the most part the film is very easy viewing and a lot of fun. Highly entertaining. The transfer of this title to DVD has been done excellently by the wizards at Madman and the animated interface is fun and easy to navigate. The video looks great and is presented in a 16:9 enhanced format. There is very little grain or mpeg artifact present at all. In fact I would go so far as to say that I didn't see any when viewing. Audio sounds brilliant and there is nothing about the sound that detriments the movie at all. This disc comes with a whole swag of extras though I must confess that my favourite parts would absolutely be the audio commentary with Mick Molloy, Richard Molloy and Judith Lucy. It is an absolute ripper. Alongside that commentary would be the swear jar that briefly features every swear word in the movie and tallies them up to a dollar value. Finally the power of music is shown in the final "flipper" sequence, where different music accompanies the same scene with a drastically different outlook to the take all due to the music. Great stuff. I think Crackerjack is the sort of movie that deserves a place in your collection. It's a well told story that is feel good for most of the movie and should make you laugh out loud on more than one occasion. I have always been a fan of Mick Molloy and after this effort even more so. Recommended!